Parenting People is here to support you with every issue that comes with being a parent – the most important job you’ll ever do. Getting parenting support when my children were small changed our family life for ever. We all calmed down, stopped shouting and learned to listen to each other. I have nearly 20 years experience now in helping any parent have a better relationship with their child. The Parenting Course , Judy Reith and Sarah Rose (2012). CLICK HERE to go to the shop page “This empowering manual for the Transform Living With Teenagers" course has helped me see what 's working, and what to do about what is not. 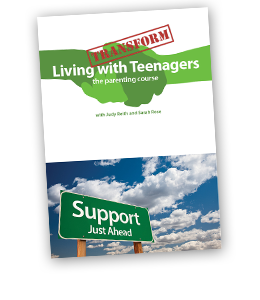 A must for any parents of teenagers who are in struggling to work out how to navigate the teen years, and a bargain too." From birth, through childhood and into the joys of teenagers, every stage brings it’s own rewards and struggles. I believe it’s a sign of strength to get help with parenting – the most important job you’ll ever do. ‘7 weeks after Judy’s parenting course finished, and I still haven’t shouted at my daughter like I used to…. a miracle!’ Dad of a 12 yr old. What does Parenting People offer parents? Many parents have said that using Parenting People services was the best parenting decision they’ve ever taken for themselves and their families. Their only regret was not contacting us sooner. Parenting People is run by me, Judy Reith – professional Parent Coach and mother of 3, now grown and flown. I have been working in Parenting Education and as a Life and Parent Coach for 20 years in London and Cambridge. I trained with Parent Network and the Coaching Academy. I subscribe to their professional code of practice. I have a team of associates who are also professionally trained and experienced coaches, family therapists and youth workers. I am a fan of The Enneagram to understand myself, and others, but I find skilful listening and intuition help more than any other tools after 2 decades of coaching. Beyond work, I love running while I still can, writing, and a G&T on Friday with friends. If you want to find out more about me, get in touch or look at the kind of sites I like on the links page or follow me on Twitter. I have a spoken on a range of parenting topics to 8 parents, 80 parents and 800+ parents to a long list of companies who wisely support their employees with parenting talks. Conferences, school talks, parents associations, professionals working with parents – any group of people interested in parenting. Please get in touch.